This post is sponsored by The National Frozen & Refrigerated Foods Association (NFRA). All opinions are my own. For more inspiration during #JuneDairyMonth, be sure to check out delicious ideas from NFRA at EasyHomeMeals.com. Want to be the cool mom this summer? I totally have your back, ladies! 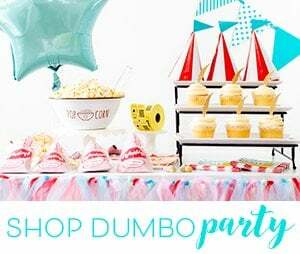 The warmer weather makes me want to host fun parties and gatherings. Not that I need a real reason to get festive, but this delicious yogurt toppings bar idea would be the perfect reward for your kids and their neighborhood friends after a day of play or treat the whole team after a job well done. It would also be just perfect for a spring brunch, birthday party and basically any kind of upcoming soirée you have planned. 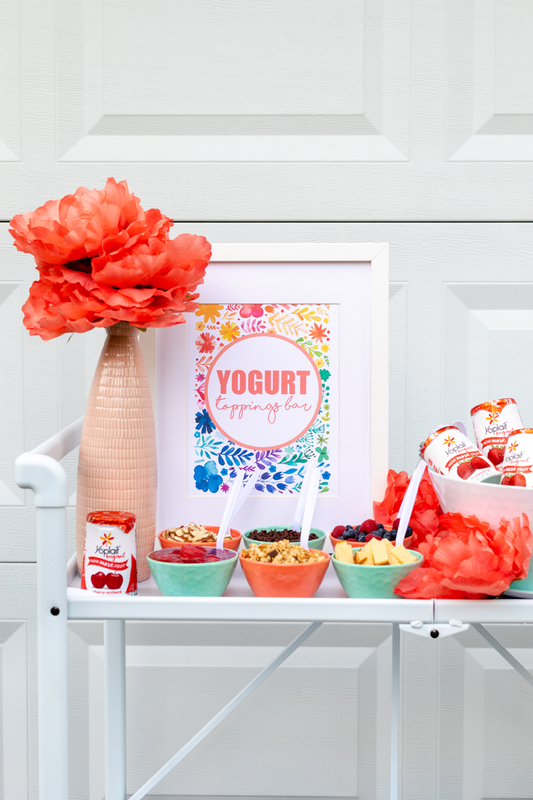 Here’s what I know… this yogurt bar will totally score you the mom of the week award for sure. Are you game? Here’s how easy it is to put together and remember, it doesn’t have to be fancy. Kids love being able to choose their own flavors and toppings. Sit back and pat yourself on the back. There are so many tasty ways to serve up yogurt with delicious toppings, so let’s get started! 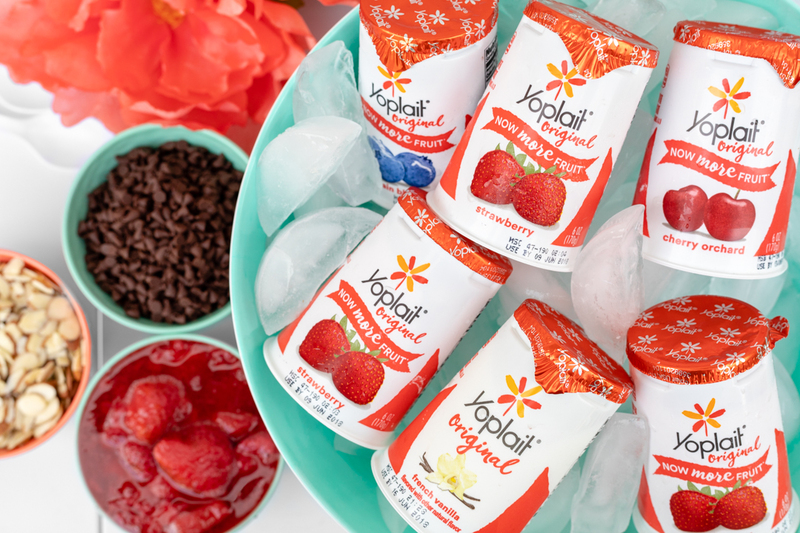 It’s all about those flavor options and Yoplait definitely has all of the flavors that everyone will love. 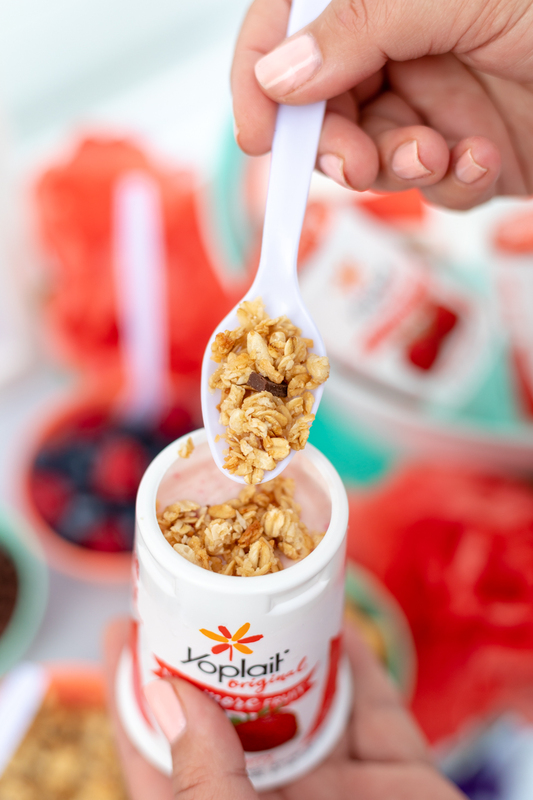 Yoplait has so many delicious flavors and options, you’ll have no problem finding the perfect flavors and varieties to create your very own custom Yogurt Bar. 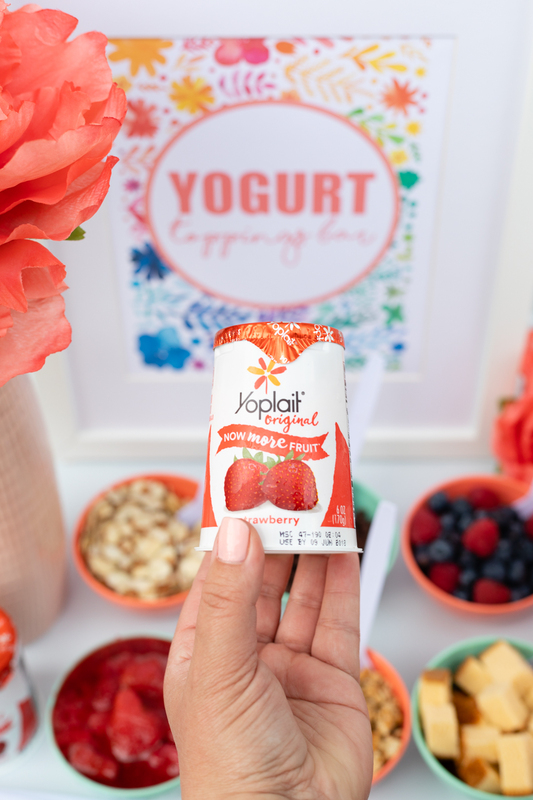 For my own yogurt bar, I wanted to feature Yoplait Strawberry and other flavors like Yoplait Original Mountain Blueberry, Yoplait Original Cherry Orchard and Yoplait Original French Vanilla to celebrate my translation of a taste of spring. With so many varieties like Yoplait Original, Yoplait Light, Yoplait Whips and Yoplait Limited Edition, this could get extra fun! Then, it’s all about the toppings! 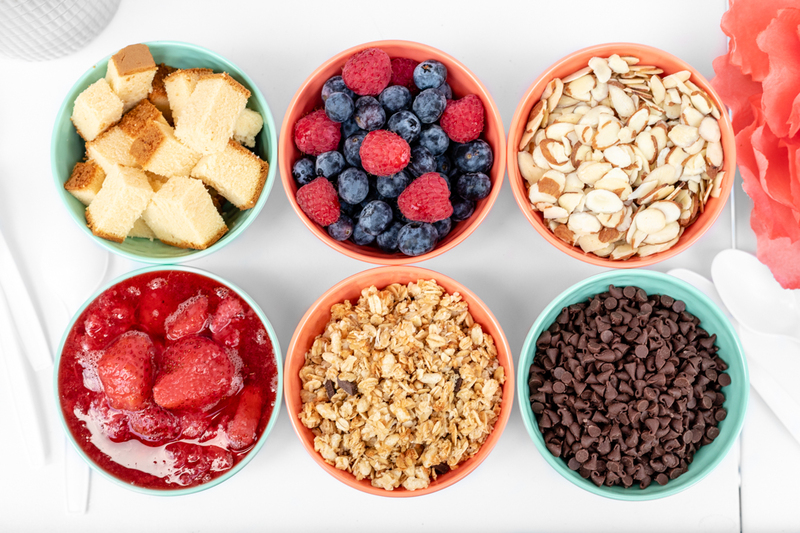 Having individual cups that are ready-to-grab couldn’t be more perfect for a self-serve toppings bar like this. That way, clean up is easy and everyone gets exactly what they want. Perfect. There are so many other topping ideas you could serve depending on your crowd anywhere from fruit to candies. For an added flair, you can add more sauces like chocolate or caramel as well as whipped topping and sprinkles. The sky is the limit, friends. Those mom points are so within reach at this point. Let’s go for the goal! Now, here is the good part. 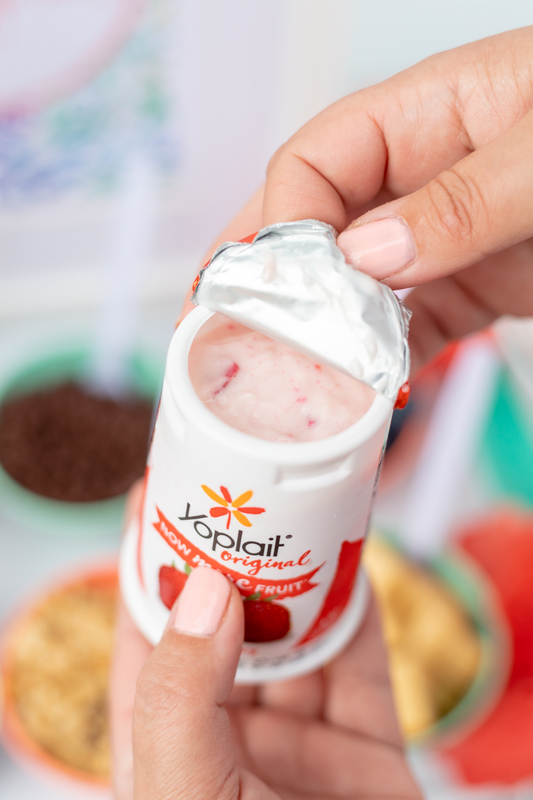 Pick your Yoplait flavor, pick your toppings and get ready to enjoy your own custom creation. A yogurt bar is sure to leave your kiddos and their friends feeling happy and satisfied. Yum! 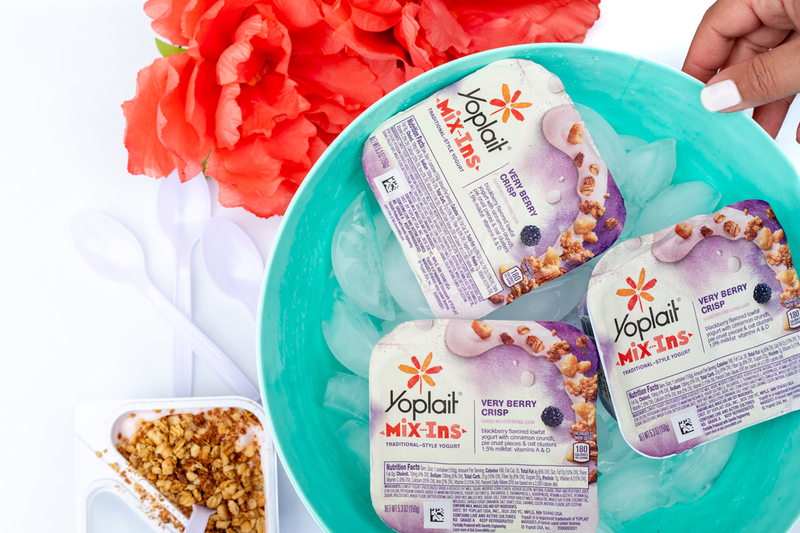 For another cool mom offering, have you spotted Yoplait Very Berry Crisp Mix Ins? We just tried this flavor the first time and oh my. Once you try it, you’ll definitely want to stock up for your kids and yourself, it’s that delicious. If you like this tasty and fun idea, make sure to Pin It! When would you serve a yogurt bar? Which Yoplait varieties and flavors will your kids love most? Love this idea! Who doesn't like yogurt? Gotta try it! 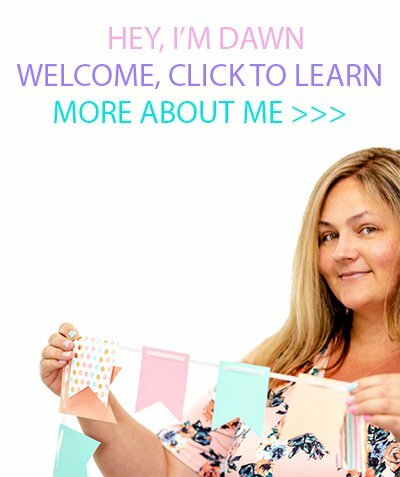 Thank you for sharing the post and topping ideas! We have yogurt bars at work lunches sometimes. I love fresh berries and granola. This is such a fun idea! Perfect for summer get-togethers! Yogurt is my favorite for easy meal ideas - gotta love those mix ins. I like using chocolate chips to add in too! My kids love Yoplait yogurt! They would love to have a bar set up with yummy toppings, I so need to try this! What a fun idea. I can definitely see a yogurt bar being great for brunches. The toppings all sound good! This looks really fun! I love to add different toppings to yogurt!! My kids are all about mixing in fresh fruit. I love this idea! I'm going to have all the grand kids over this weekend and a yogurt bar will be perfect, fun and delicious! A yogurt bar would be wonderful for breakfast. The list of toppings that can be used is endless. I love adding granola and berries to my yogurt. A yogurt bar sounds like an amazing idea! It's so much fun to add topping into yogurt, especially when everyone's making a party of it.